BIOCOM Global Life Science Partnering Conference March 1st, 2018 in San Diego, CA. Redefining Early Stage Investments (RESI) JPM 2018 January 9, 2018 at the Marines' Memorial Club & Hotel in San Francisco, CA. Amarantus Bioscience Holdings (AMBS) is a biotechnology company developing treatments and diagnostics for diseases in the areas of neurology, regenerative medicine and orphan diseases through its subsidiaries. 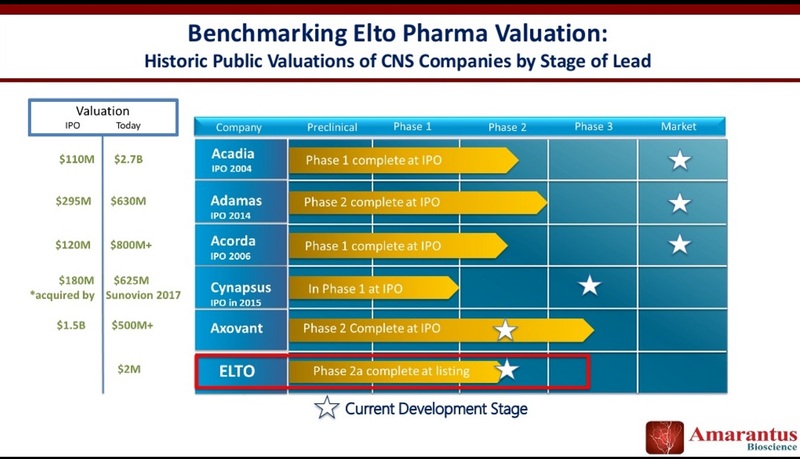 AMBS' wholly-owned subsidiary Elto Pharma, Inc. has development rights to eltoprazine, a Phase 2b-ready small molecule indicated for Parkinson's disease levodopa-induced dyskinesia, Alzheimer's aggression and adult attention deficit hyperactivity disorder, commonly known as ADHD. AMBS acquired the rights to the Engineered Skin Substitute program (ESS), a regenerative medicine-based approach for treating severe burns with full-thickness autologous skin grown in tissue culture that is being pursued by AMBS' wholly-owned subsidiary Cutanogen Corporation. AMBS' wholly-owned subsidiary MANF Therapeutics, Inc. owns key intellectual property rights and licenses from a number of prominent universities related to the development of the therapeutic protein known as mesencephalic astrocyte-derived neurotrophic factor "MANF". MANF Therapeutics, Inc. is developing MANF-based products as treatments for brain and ophthalmic disorders. MANF was discovered by the Company's Chief Scientific Officer John Commissiong, PhD. Dr. Commissiong discovered MANF from AMBS' proprietary discovery engine PhenoGuard. AMBS also owns approximately 79.25 million shares of Avant Diagnostics, Inc. via the sale of its wholly-owned subsidiary Amarantus Diagnostics, Inc. that occurred in May 2016. Engineered Skin Substitute (ESS) is a tissue-engineered skin prepared from autologous (patient's own) skin cells. It is a combination of cultured epithelium and a collagen-dermal fibroblast implant that produces a skin substitute which contains both epidermal and dermal components. This model has been shown in preclinical studies to generate a functional skin barrier. Most importantly, because ESS is composed of a patient's own cells, it is less likely to be rejected by the immune system of the patient, unlike with porcine or cadaver grafts in which immune system rejection is a possibility. A non-GMP version ESS has been used in investigator-initiated and compassionate-use clinical settings in over 150 human subjects, primarily pediatric patients, for the treatment of severe burns up to 95% of total body surface area. The non-GMP version has also been used in the treatment of two patients with Giant Congenital Melanocytic Nevi (GCMN). In July 2015, Amarantus' acquired Lonza Walkersville's wholly-owned subsidiary Cutanogen Corporation, the sole licensor of intellectual property rights to ESS from Cincinnati's Shriner's Hospital for Children and the University of Cincinnati. Cutanogen Corporation is a wholly-owned subsidiary of Amarantus.